These cookies are not only soft and chewy but they are wonderfully thick. The perfect after-school snack, lunchbox dessert, or midnight craving. Add a cold glass of milk and you have a marriage made in heaven. In a mixing bowl beat the butter for 1 minute, add the sugar and continue beating until light and fluffy for 3-4 minutes. Add eggs one at a time, beating 1 minute after each egg. Blend in milk and vanilla. Wisk together flour, baking soda, cream of tartar, and salt and stir into the creamed mixture. Form balls into 1 1/2-inch balls. Roll the balls in the cinnamon and sugar mixture. Place balls 2 inches apart on greased cookie sheet. Lightly flatten balls with the bottom of a tumbler. Bake cookies at 375° F until done, 10-12 minutes. Makes about 4 dozen. Remove and let cool on a baking rack. The original recipe calls for 1 cup chopped nuts but I always leave them out because my family prefers them without. The cookies turn out great either way. Don’t bring the butter to room temperature. You don’t want it too warm to start with. Take it straight out of the fridge, cut it in cubes and by the time you have all the other ingredients ready, the butter will be the perfect temperature to begin. The key to fluffy, soft snickerdoodles is beating the butter and sugar mixture until light and fluffy for approx 5 minutes. I beat again for one minute after I add each egg. One thing that helps when rolling the balls, chill the dough for about 30 minutes before you begin. Otherwise, it gets all sticking because of the warmth of your hands and is harder to roll into a ball. Also, it won’t flatten out so quickly when baking because it has been chilled. 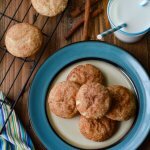 The cinnamon and sugar adds a nice coating and complements these cookies nicely. I tend to use a lot of cinnamon because I like the darker color it adds and I want to really be able to taste it. Start checking on the cookies around the 10-minute mark. Don’t make the mistake of over baking. Their edges should not have a crispy brown edge or the bottoms be dark brown. You’ll notice them puffing up while baking and at some point, they’ll start crinkling down. That is completely normal, so don’t be alarmed.